Whoa, that’s a mouth full. So let’s talk about how I am obsessed with the chipotle, cheddar, sweet potato, avocado flavors. I have been feeding them to my family at least once a week since I made these Healthy Chipotle Chicken Sweet Potato Skins. These flavors pretty much blow my mind. I love the sweet and spicy combo. Pretty much though I just love anything in involving chipotle chiles and avocado. Ok so then there is the roasted garlic. Roasting garlic is my new favorite thing. It caramelizes the delicious cloves and makes them so sweet. It is pretty much just amazing. It also mellows out the intense flavor garlic leaves behind, which my dad was very happy about. I pretty much get scolded every time I use garlic (especially raw), which is EVERYDAY (but I don’t always caught). Garlic breath, he hates it! All I have to say is I am keeping the cancer away. Far, far, far away! That normally shuts him up. Oh, and the Avocado Ranch. You HAVE to make the Avocado Ranch. It goes with this burger like butter goes with bread. It is a million times better than the bottled stuff you buy in the store with things like mayo (eww, I am totally grossed out by this condiment) and sugars and other bad things in it. It is totally easy to make and trust me once you make it once you will be making it over and over again. Use on a salad, use to dip vegetables, use it to dip your buffalo chicken in and use it for the burger! It is a MUST. No question. The Cheddar? Yeah, that is just on there because we like cheese. ALOT. 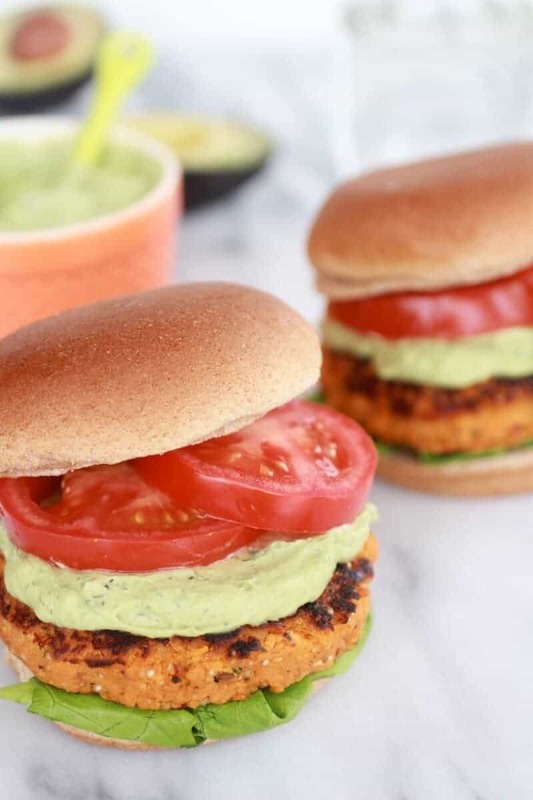 If you want to make this burger vegan you can opt out of the cheese and swap the egg for a flax egg (or other vegan egg substitutes). So when you’re making the patties you are probably going to think the mixture is too wet, it’s not. Just do the best you can to shape them and make sure you get both sides really nice and crispy. Seriously, you want them crispy. Oh and I almost forgot to tell you how good these burgers are atop a salad, covered in the Avocado Ranch. It is a very versatile burger! Ok, so one last time. 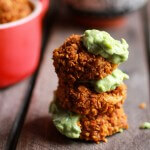 Roast some garlic, mash it with some sweet potatoes, quinoa, chipotle and then form them into patties. 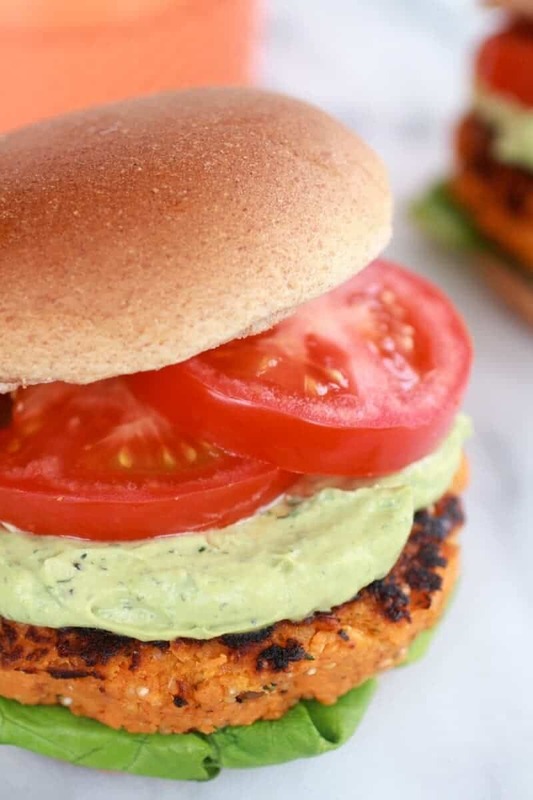 Get those patties all nice and crispy and then slather on the Avocado Ranch. And please, don’t skimp on the Avocado Ranch. for topping: avocado ranch lettuce, tomatoes, maybe more cheese or whatever you want! Preheat oven to 375. Chop off the top portion of the garlic head to reveal cloves. Peel any excess paper/skin off from the bulb of garlic. Pour about a teaspoon of olive oil on top the garlic cloves and cover with foil and roast in a baking dish for 45 minutes, or until golden brown. Pierce potatoes (I used 2 large) all over with a fork and place in the oven with the garlic. Roast about the same amount of time as the garlic or until the sweet potatoes are soft. When garlic and potatoes are done remove from the oven and let cool 5 minutes. To remove the garlic squeeze from the bottom of the garlic head to remove carmelized cloves. Mash and set aside. Peel the skin away from the sweet potatoes and mash in a medium size bowl. Add the garlic, cooked quinoa, egg, flour, chipotle peppers, adobo sauce, lime juice, cilantro, smoked paprika, salt and pepper. Mix to combine and then fold in the cheddar cheese. Place bowl in the fridge for 15-20 minutes. This helps form them into patties, but making them will still be messy! While mixture is chilling make the avocado ranch. Combine all ingredients in a food processor and blend until creamy, scraping down the sides occasionally when needed. Taste and season additionally if desired. 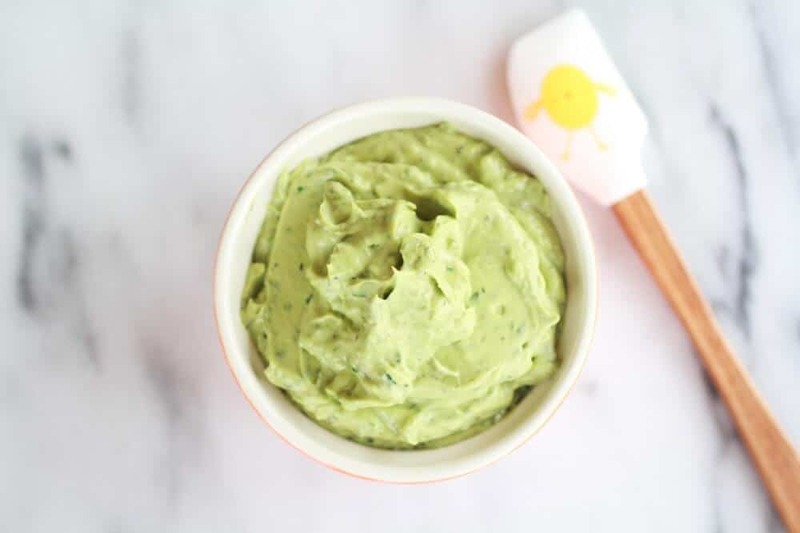 The avocado ranch can be stored in a seal-tight container for 1-2 days. Heat a large skillet over medium heat and add 2 tablespoons olive oil. Remove mixture from fridge and form into 4 equal patties, then place in the skillet once hot. Cook for 5-6 minutes. The if needed add more oil and flip the burgers very gently (be gentle, they crumble easily when hot). Cook for another 5-6 minutes. Toast buns if desired. 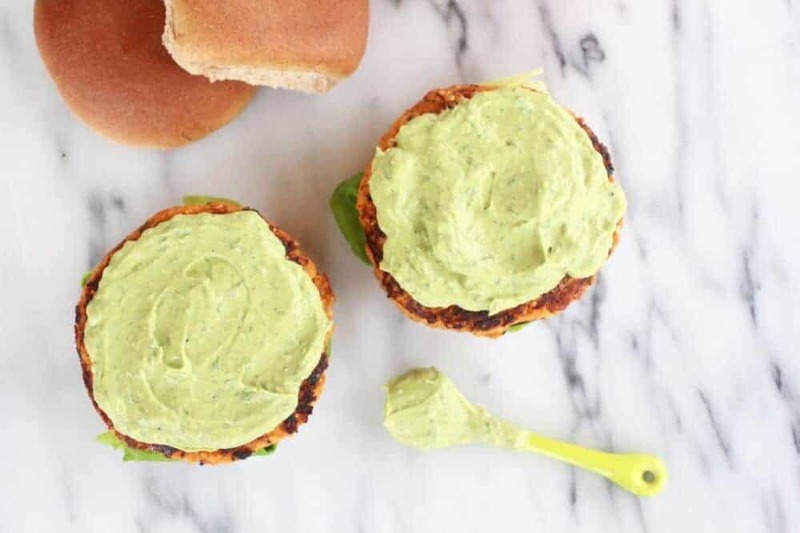 Place on a bun and top with a whole lot of avocado ranch! Now that’s a whole lot of Burger. Gorgeous burgers and your photos are stunning. 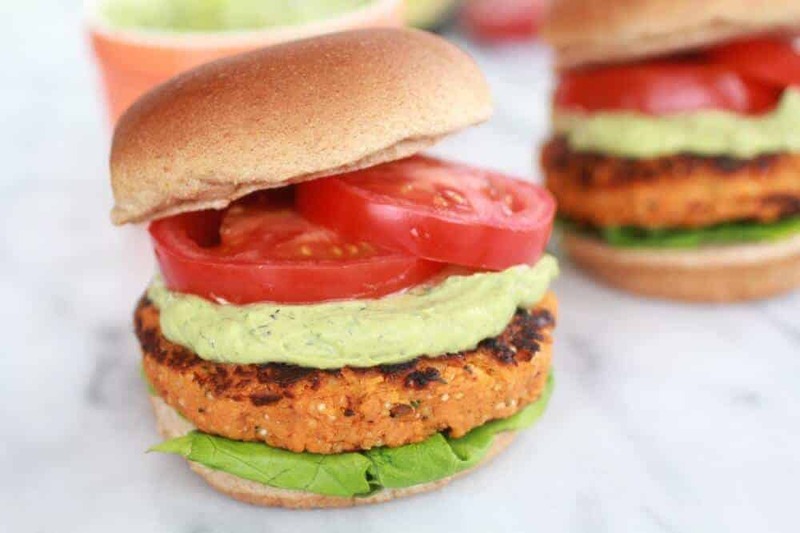 We LOVE veggie burgers! I made some sweet potatoes a while back but never blogged about them. Now I want to make them again! This was my first sweet potato burger and I am now in LOVE!! Thanks so much for reading Cassie! 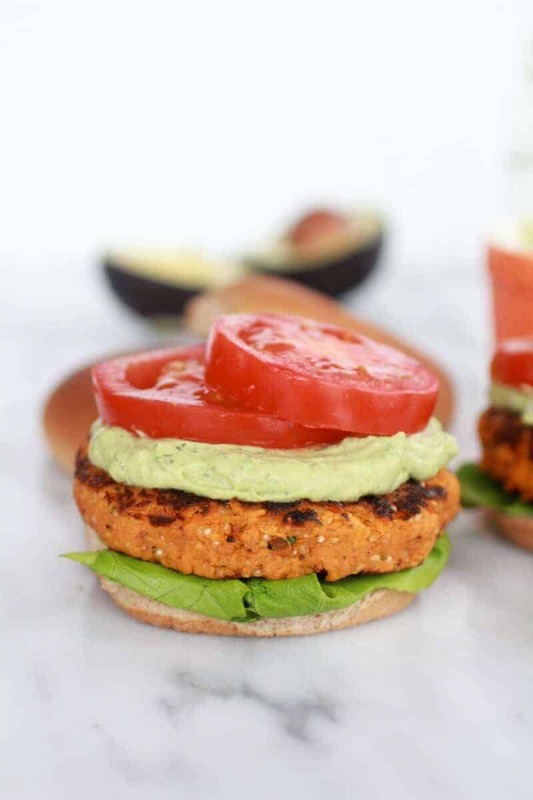 I would have never have thought to do a sweet potato burger! Genius girl! Thank you Meagan and again thank you so much for reading! It is very exciting for me to have you as a reader!! 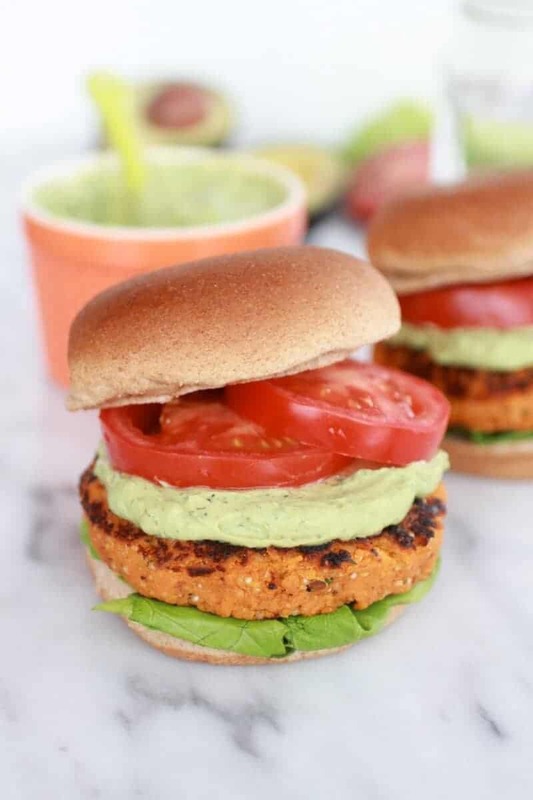 These sweet potato burgers look amazing… I can’t wait to give them a try (I have tons of sweet potatoes in my pantry right now)! Thank you and let me know if you give them a try! These look and sound unbelievable!! 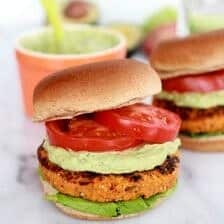 Not only does the combination of chipotle seasoning and sweet potatoes in burger form sound amazing, but the avocado ranch really puts it over the top for me! Thank you for sharing :). Thank you!! I love these flavors! Hope you give them a try! The avocado ranch is awesome!! 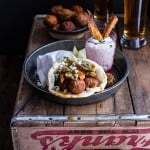 You have to give it a try, it compliments the burger so well! Oh my goodness. This looks so amazing! I found this recipe at Or So She Says…! Happy Easter! Thank you and I hope you had a great Easter! Popping over from Six Sister’s link party! 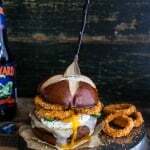 Um…this burger looks amazing! Totally pinning this and making something inspired from this! Thank for stooping by, I hope you love the burger! Visiting from Skip to My Lou. I am intrigued by this recipe. They look wonderful and I love chipotle. I bet it tastes fantastic with the sweet potato. Thanks for sharing a great recipe! Thank you I hope you give them a try! Thank you and thanks for the invite! 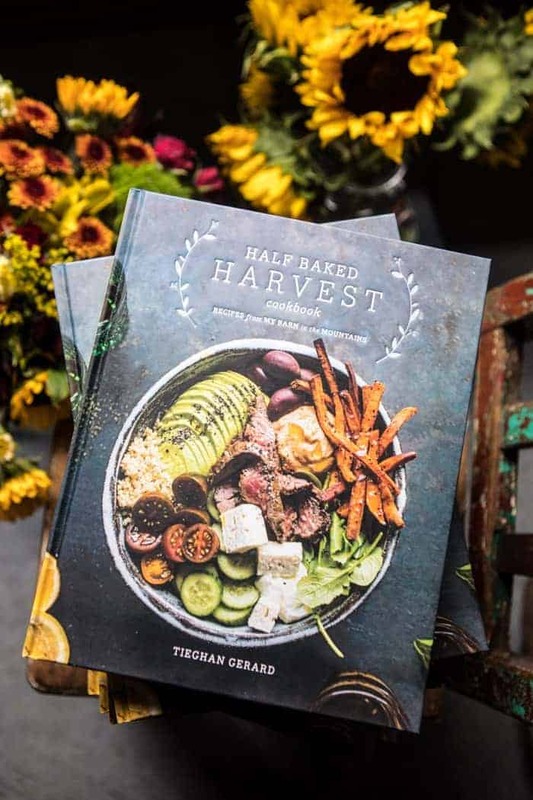 You have the most amazing recipes! 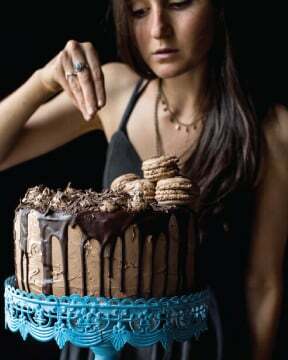 So making this! Thank you so much! 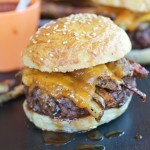 I am so glad you like me recipes and I hope you love these burgers! Saying hello from the What’s Cookin Love link party. These look delish. I love sweet potatoes in any form but covered with marshmallows. I will definitely give these a try. Pinning! Thank for stopping by and thanks so much for pinning! This is an amazing Burger!! I am salivating 🙂 I know our readers would love to see this post. Your pictures are gorgeous. We’d love for you to join us at our weekly All Things Thursday Link Up Party at allthingswithpurpose.com. Hope to see you there! Thank and thanks for the invite! Thank you and thank you so much for following!! I am always excited to have a new follower! This makes my mouth water! I would love it if you would come share this & any other recipes you may have over at my Sweet & Savory Saturday’s Link Party. It ends Monday at midnight. Right on! This really is the perfect combination of flavors! I have to admit to being a little jealous of your super vibrant tomato though 🙂 It’s been a while since I’ve found a great one like that. 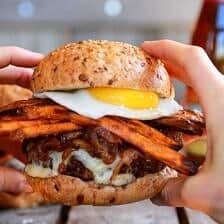 These burgers looks so amazingly delicious! Thanks for sharing! My god these sound amazing. I recently made sweet potato burgers for the first time. Would’ve loved to have some avocado ranch to top them off! The avocado ranch is the best! seriously, so good! Quick question – do you rec any dairy-free subs for the cheddar in the burger? Honestly, I would just leave it out. Unless you want to use a vegan cheese, which I personally am not a fan of. The burgers will stil be delicious without it, the avocado ranch will make up for the no cheddar. I hope you love these! 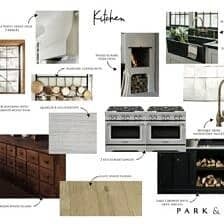 u got a nice collection of recipes.. Ya! Thank for for following along! Ha! Thank you for correcting me! I must of missed that when I proofed my post! Let me know if you try these and I hope you love them! This looks sooooo yummy! Thanks for sharing! Featuring it at http://www.createitgo.com today as part of Gingersnap crafts cohosts. 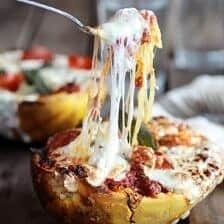 Another amazing and awesome recipe — wow! Pinned! Thanks so much for sharing on Busy Monday! Thank you Charlene!! Thanks for pinning and hosting a great party every week! These look fantastic, is it possible to grill them on the BBQ? Hmmm? I do not know. You could try, but I would recommend putting the patties in the fridge for 30 minutes before you grill them to help them stiffen up. even then though, they might be hard to flip. Hope this works! Are these spicy? And if so.. is there a way to lower the spice without losing the flavor? Hey Maggie! They are not all that spicy, but to tame the heat I would reduce the amount of chipotle peppers to your liking (maybe adding only 1 or half of one). Hope this helps and I hope you love the burgers! I can’t wait to try these. Can I assemble them the night before a cookout and just keep them wrapped in wax paper until ready to cook? Yup!! Assembling the night before is perfect. Hope you loved these!! 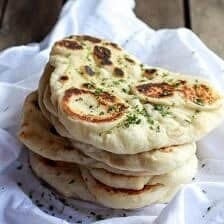 I just made these for dinner tonight. oh. my. goodness. so flippin good! thanks for being a crazy cooking genius! So happy you loved these!! THANKS!! Made these last night – didn’t have the chile adobo and used smoked chiles instead. Very tasty! I’m thinking I might use a little veggie broth next time when I cook the quinoa to see how that would meld with the flavors. I ate these in wraps with salad greens, the avocado ranch and onions. This was the first time I roasted garlic without removing the bulbs and pan roasting them. Keeping the bulb in tact seems to reduce browning and allowed me to get the garlic nice and caramelized. Thanks for the recipe! So happy you enjoyed these! Thank you! Made these tonight. The flavors are delicious but the burgers were so wet they didn’t hold shape or seem to cook through. Suggestions for next time?